Slice is a collaborative project that seeks to uncover relationships between perception and movement, ephemeral experiences and the concrete materiality of everyday life. In “Stop-Action” artist Rania Ho has handcrafted a scale reproduction of a familiar everyday object—a ping-pong table—out of low-cost commonly found materials. The inertness of this mundane object is humorously offset with a hint of movement through the form of a constantly levitating ping-pong ball… painter Wei Weng has created a site-specific wall painting entitled “As Prospects Get out of Range”… the artist seeks to invent idiosyncratic visual narratives in inadvertent urban spaces through the use of diverse media including paintings, cutouts and installations. 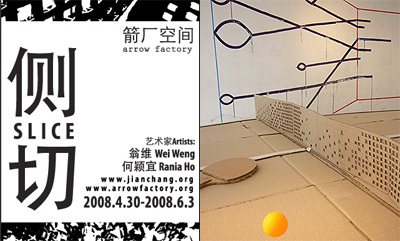 Arrow Factory exhibitions represent a unique approach to contemporary art making that is defined by mediating relationships with the local surroundings and the aesthetics of urban space.